In Bangkok, from left, are Cal Lutheran’s Dane Rowley, Harry Domicone, Gerhard Apfelthaler and Chris Kimball, Assumption University’s president, the Rev. Brother Bancha Saenghiran, university registrar Soonthorn Pibulcharoensit, study abroad director Vanvisut Viravan, study abroad manager Nunapas Somboonsakdikul and dean Kitti Phothikitti of the Graduate School of Business. 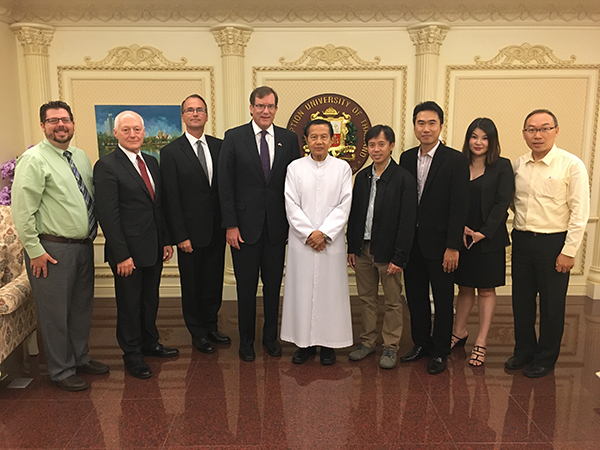 When Cal Lutheran President Chris Kimball shook hands in September with Assumption University of Thailand President Bancha Saenghiran in the latter’s grand and formal office, there was more at stake than protocol and an introduction. Staff members from both universities had spent two years establishing a relationship between the leaders. Kimball’s visit to Bangkok was viewed by his Thai counterpart as a demonstration of Cal Lutheran’s commitment to partnering with Assumption on a new MBA program. The agreement with Assumption, a private Catholic school of 19,000 students, is the first in what Cal Lutheran leaders hope will be a series of so-called articulation partnerships with universities abroad. The Thai students will split their education, studying first at Assumption, then transferring to Cal Lutheran to complete their MBA requirements during three terms, or nine months. Upon graduating, they will earn MBA degrees from both institutions. Roughly 20 students per year are expected to enter throughout the academic year, starting with the current winter term. They apply through Assumption, meeting GPA and English-language requirements, among others. In more traditional approaches to international recruitment, the university has sent and received students through exchange programs, and also sent representatives overseas to attract students to complete their entire education at Cal Lutheran. The Thai partnership is different because it not only creates a track for incoming international students to follow but also helps the foreign institution attract residents who might otherwise go to the U.S. for their full degree program. The delegation that visited Thailand in September also traveled to Chengdu, in southwest China, where partnership discussions were held with three universities. Institutions in this region are home to as many as 100,000 students. In addition to Thailand and China, Cal Lutheran leaders are targeting Taiwan, Japan, India, Vietnam, Myanmar, Austria, Norway, Sweden, Denmark, Russia, Iceland and Saudi Arabia. In Malaysia, where two-year colleges are common, arrangements are being considered to allow students to come to Cal Lutheran to complete bachelor’s degrees. The relationship with Assumption in Thailand could ultimately result in shared degrees for undergraduate students, as well as exchanges of faculty members. “If we are going to prepare students for global realities, we have to be engaged and involved with stakeholders wherever they are in order to diversify our student body and help students prepare for international competition,” said Harry Domicone, director of the Full-time MBA Program for International Students based in Thousand Oaks. Cal Lutheran has 393 active MBA students, and more than half are international. “There is a huge demand in the business world for people with MBA and IT degrees. Students see that a master’s degree in the U.S. will help them with opportunities, so it’s more of an economic decision for graduate students. Undergraduates want to come and have an American experience, so it’s more of an emotional as well as economic decision,” said Dane Rowley ’04, M.S. ’08, director of international admission. Despite the competition for international students, Cal Lutheran recruiters are not salespeople. “The market has become much more aggressive, and there are those who admit any applicant at any price. We hold to our high admission standards and that brings us a lot of credibility,” Domicone said. In countries where relationships and personal recommendations are crucial for students, there is usually a middleman, an educational counselor who promotes certain universities. One such intermediary is Dan Plaut, a U.S. citizen who has lived and worked with students in western China for a total of 20 years, and earned the trust of Chinese families. He represents Cal Lutheran, promoting its programs, location and safety – all important factors for parents of prospective students. While Cal Lutheran has always recruited internationally, the idea for creating bilateral partnerships began in 1998 when Apfelthaler and Domicone met during a coffee break at an educational conference in Italy. Apfelthaler at that time worked for a university in western Austria, and was seeking partnerships to develop a study abroad program. Domicone was recruiting students for Cal Lutheran. The men kept in touch, visiting one another and establishing a student exchange agreement between their universities, Cal Lutheran’s first. The benefits of international education at Cal Lutheran extend to American students, even if they never leave California, according to Domicone.